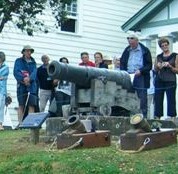 During the recent successful “Blazing Cannons” events, organised by Russell Museum in conjunction with John Osborne DTT, FSG Commandant NZACFRS Inc. held on the foreshore in front of the Russell Town Hall and alongside our Russell cannon, many locals and visitors asked if our cannon was going to be fired as part of the event. Upon learning our cannon has been silent since its last firing in March 1907 when Lord Plunket, New Zealand’s Governor General, who was standing right next to it, received “a violent start, and his top hat fell off’, the inevitable “why not fire it again” was posed. Why should we restore our cannon? Symbolically standing guard on our foreshore, it is a striking and tangible link with our past and is one “point of difference” that sets us apart from our neighbouring coastal communities. What would its restoration bring to our community? Imagine starting the Tall Ships Race, the Hone Heke Run or the first Birdman flight every year, with a blast from our cannon. It would sweeten the experience that is uniquely Russell/Kororareka. Russell Museum has found the expertise, we ask you to join us and make it happen. 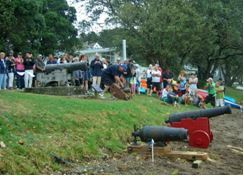 Restoration of the cannon, belonging to the Russell community, is estimated to cost $12,500.00. Any donations large or small will be gratefully received at Russell Museum, 2 York Street, Russell 0202. Donations to the restoration of our cannon are tax exempt under Russell Museum’s charitable status. For further information call 09 4037701.